Lương Xuân Đoàn was born in a French maternity hospital (nhà hộ sinh) on Nguyễn Thái Học Street in Hanoi on 17 June 1952 and grew up in a cultured home environment. His mother owned a successful children’s tailoring company, while his father worked for the Democratic Republic of Vietnam’s (DRV) Central Hồ Chí Minh Communist Youth Union (Trung ương đoàn thanh niên cộng sản Hồ Chí Minh). Many of his extended family members were involved in the arts, most notably his uncle, Lương Xuân Nhị, a famous Vietnamese artist. Throughout his childhood, Lượng Xuống Núi taught Đoàn drawing and painting, giving him a wealth of education that he lacked in school. Due to the Second Indochina War, Đoàn moved schools constantly as a boy and as a young man. He attended two elementary schools, Điện Biên Elementary School followed by Thăng Long Elementary School. He attended Vạn Phúc High School until grade 7 before he was transferred to a school in Quảng Oai, a small town outside Sơn Tây, as part of the 1966 Hanoi evacuation programme. When he returned to Hanoi in 1967, Đoàn studied at a fine art vocational college (trường trung cấp) in Hiệp Hòa, a township in Hà Bắc Province. He continued his high school 8, 9 and 10 grades at this vocational college, together with studying fine art. In September 1972, before he finished high school at the vocational college, Đoàn joined the People’s Army of Vietnam (PAVN). However, due to the policy at the time to attract young men to join the army before completing their education, Đoàn received his high school graduation certificate that same year. Đoàn was assigned to Division 304B, a group made up of doctors, students, teachers and artists that acted as a supplementary unit to PAVN forces. Not long after joining, in March 1973, Đoàn and his division were sent south along the Ho Chi Minh Trail to Front B3 in the Central Highlands (Tây Nguyên), where Đoàn worked for the Tây Nguyên Liberation Army newspaper (Báo quân giải phóng Tây Nguyên mặt trân B3). 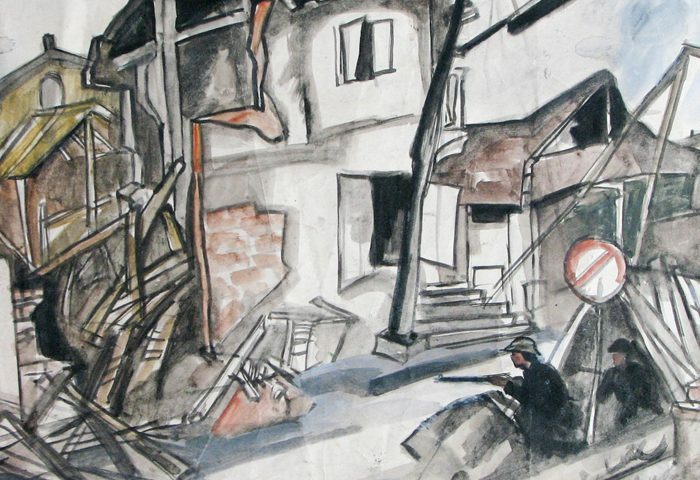 In this role, Đoàn followed various units on assignments to sketch and document their daily lives. As the Paris Peace Accords were signed in January 1973, many PAVN soldiers based in South Vietnam were allowed to return to their homes in North Vietnam. For Đoàn, however, the army arranged for him and his unit to remain in Military Zone B3 to support any and all remaining troops. Đoàn remained in South Vietnam until 1975, when, in January, the PAVN sent him to study a diploma course at the Vietnam Fine Arts College. Durning 1977 and 1978, while both a student and a soldier, Đoàn was sent on a military assignment to Khánh Hòa Province to sketch and paint naval soldiers in preparation for his final exam. On this assignment he also sketched the scene of what would become one of his most famous paintings. In April 1979, Đoàn was sent by the army to Đồng Đăng in Lạng Sơn Province to record the after effects of the short but bloody conflict with China and the daily lives of the borderlands security (bộ đội biên phòng) based there. The military sent artists like Đoàn to the border to expand their experience of the realities of war, which Đoàn noted in the bodies still lying exposed to the elements when he arrived. His quick sketches, made sometimes without soldiers knowing, were then developed into complete paintings when he returned to Hanoi. Đoàn graduated from the Vietnam Fine Arts College in 1980, making a name for himself in his final exhibition by completing a detailed version of what he recorded in Khánh Hòa Province; Sunset over Hòn Tre Island (Hoàng hôn trên đảo Hòn Tre) (1980) was given high marks and set the trend of painting in colour on silk. In the same year, the same painting won first prize at the 10th National Fine Arts Exhibition. After graduation, and with the rank of Lieutenant, Đoàn started work at the military art workshop of the Political Department of Defence (Xưởng mỹ thuật quân đội của bộ quốc phòng tổng cục chính trị). He travelled between a number of units and locations along the Ho Chi Minh Trail to paint previous battlegrounds of the conflict in the Central Highlands and soldiers still based there during peace time. The works he created included Trường Sơn Angels (Thiên Sơn Trường Sơn) (1984) commemorating the young girls who fought and died on the Ho Chi Minh Trail. Đoàn described his inspiration for the work coming from a sudden breeze that blew when standing in front of a mound of discarded female sandals. Although he was sent by the Political Department of Defence, Đoàn kept most of the works he created for himself. He recreated Trường Sơn Angels when he worked at a creative studio 70 kilometres from Moscow between December 1984 and January 1985. 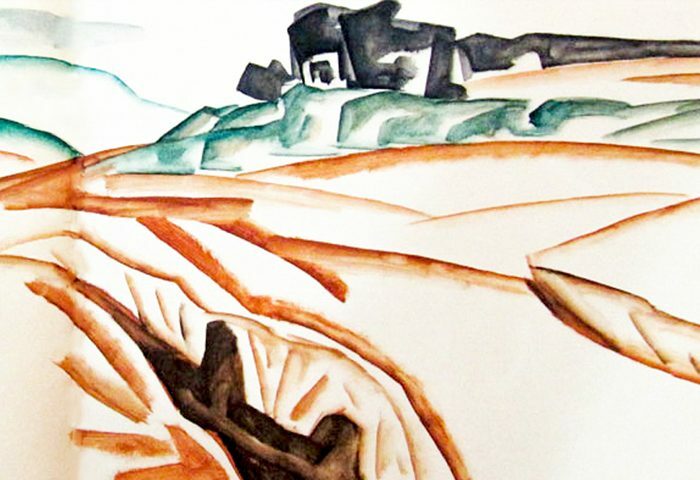 Specializing in oil and silk painting, his works faithfully reproduced his impressions of reality. Đoàn also distinguished himself with his book and magazine illustrations. 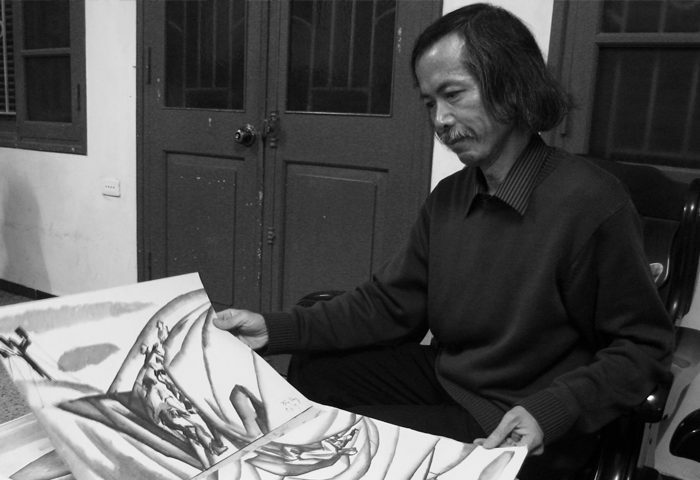 Đoàn was made a member of the Executive Committee of the Association of Plastic Artists of Vietnam from 1983 to 1988. After his return from the Soviet Union in 1985, Đoàn was transferred to the Central Party Propaganda Committee (ban tuyên giáo trung ương đảng) and worked as an art expert, managing art activities across the country. Đoàn was later made deputy director general of the Culture and Arts Department of the Central Party Propaganda Committee (phó vụ trưởng vụ văn hóa văn nghệ) and continued his work as a senior official managing and advising culture and arts nationally. He also continued working for the Vietnam Fine Arts Association, which he joined in 1983 and, in 2014, was made permanent vice-chairman of the Association. While working with the Vietnam Fine Arts Association, Đoàn strongly supported young artists who, after the 1986 economic reformation in Vietnam (đổi mới), pursued new Western artistic styles and drastically changed the aesthetic of Vietnamese art. Although many of these young artists met considerable opposition for their new styles of art, Đoàn sympathised with them and helped them practise and distribute their works. Đoàn himself continued with his own modern art project, experimenting with a new technique of combining a nib ink pen with Chinese brushstrokes to paint oriental abstract art in black and white. At the end of 2018, Vietnam opened the first Valuation and Appraisal Office to curb the increase of fake art works in the country that proliferated after đổi mới. Đoàn helped establish the office and was made chairman of the Fine Arts and Graphics Department when it opened. Lương Xuân Đoàn lives in Hanoi. Lương Xuân Đoàn, 24 April 1979. Lạng Sơn Province on the Chinese border. Watercolour on machine-made paper. Lương Xuân Đoàn, 1979, area near Đồng Đăng, a town of Cao Lộc District, Lạng Sơn Province on the Chinese border, "Pháo đài thép Đồng Đăng (Steel Fortress Đồng Đăng ('Steel' in this case is used figuratively, not literally))." Watercolour on machine-made paper. 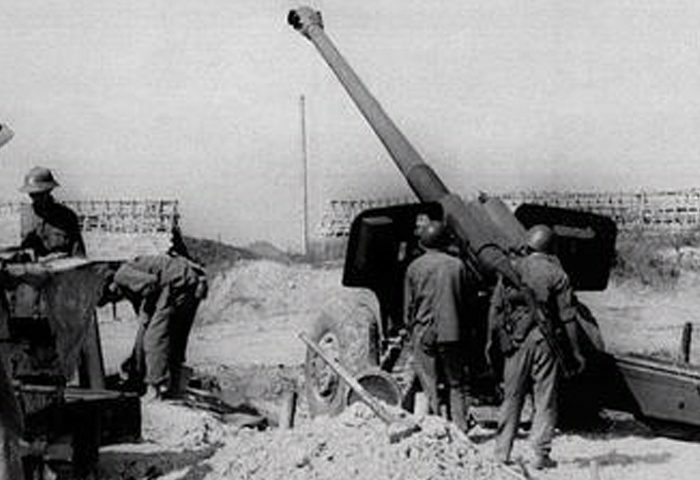 Lương Xuân Đoàn, 26 June 1979, Lạng Sơn Province on the Chinese border, "Nhà máy điện Lạng Sơn (Lạng Sơn Power Company)." Graphite pencil on machine-made paper. Lương Xuân Đoàn, 19 April 1979. Đồng Đăng, a town of Cao Lộc District, Lạng Sơn Province on the Chinese border. Watercolour on machine-made paper. Hà Bắc Province was divided into Bắc Giang Province and Bắc Ninh Province in 1996.